Sleeps 4+2, very private, two secure parking spaces, clean and bright. Flat 2, Hepworth House is situated in the quiet, residential area of Canford Cliffs, being 1 minute from the Cliffs and 3 minutes from the award-winning Sandbanks beaches on this part of the south coast. Developed as part of a large, red-brick house behind secure electric gates, the flat occupies the first floor at the rear of the property overlooking the garden and comes with two secure parking spaces. Canford Cliffs village is 3-minute walk away where shops, banks, bakeries, cafes, a deli, newsagents, restaurants and hairdressers are all situated. Several quality restaurants are also all within a 2-3 minute walk of the property and Canford Cliffs beach is just down the path at the end of the road. The flat comprises one double bedroom, with ensuite shower room/WC/sink and heated towel rail, complete with television and DVD player. The second bedroom can either be a double or a twin room, with hotel-standard interlocking beds and the space to add a z-bed in as well, for children and it also has a TV. A travel cot and high chair are also provided for those with young families, giving plenty of sleeping/eating arrangement options to suit most requirements. A second, family bathroom is situated near the bedrooms and has a bath as well as a shower screen and shower head, WC and sink and heated towel rail. The sitting room is bright, airy and has plenty of comfortable seating, TV, DVD-player, games, books for all ages and an iPod docking station. The kitchen is fully equipped with seating for six, a large gas hob, oven and a generous fridge/freezer, extractor hood, champagne, wine, large and small glasses, Neptune mugs, crockery and cutlery. Also provided are tea towels, oven gloves, linen napkins, kitchen scales, hand blender, flask as well as ample pots, pans and baking trays. There is a washing machine and tumble dryer in the separate utility room, off the main corridor, as well as an iron/ironing board, hair dryer and clothes airer. All linen and towels are provided, including tea towels and bath mats and there is a large storage cupboard off the main corridor for coats, hanging space, bags, clothing, shoes etc. Whilst we have two private parking spaces at the flat, should you decide not to use a car, there are bus stops at either end of our road mean you have immediate access to easy transport links all round the area, the nearest train stations are Branksome station (2.2miles) or Bournemouth station (4.5miles) and we love cycling from the flat to the beach down the path and along the sea front. My husband and I bought this flat in 2015 and love the area so much that we have decided we want to use it ourselves and share it with other people who enjoy Dorset, the beach and quiet, clean, airy accommodation for 1-6 people. We have spent a long time equipping and furnishing the flat in a tasteful way with high quality items that enhance anyone’s stay. We hope you love it too. Having studied in Bournemouth years ago, it is something of a full circle that we have ended up buying a property here to enjoy with our own family. The flat is in such a gem of a location, very close to the cliff top, to the beach, to the village of Canford Cliffs where most things are to hand and yet it is so quiet, leafy and private. A real find. Within walking distance (5 mins to any of these) of the beach, a bakery, a deli, a corner shop, banks, fantastic restaurants, hairdressers and cafes, our flat provides you with an incredibly accessible outdoors lifestyle. Whether you enjoy cycling, wind surfing, kite surfing, sailing, rockpooling, walking, jet skiing or just watching the waves, our flat is the perfect base for an individual or group up to 5 people, including babies, children and even grumpy teenagers! Ensuite with shower, wc, heated towel rail and sink. Bathroom with full-length bath and shower, heated towel rail and wc. All bed linen, bath towels, tea towels, bath mats and linen napkins included in the rental price. Two off-road secure parking spaces within the property behind electric gates. One large bath towel provided per person. Please do not take them to the beach. 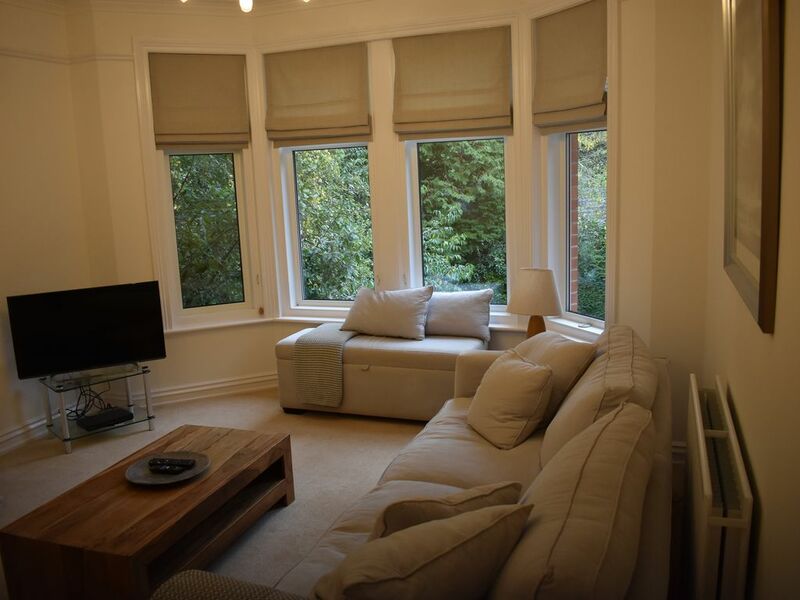 Sitting room, spacious and fully furnished with two large, comfortable, squidgy sofas and a TV/DVD player, coffee table and ottoman with loads of cushions and some rugs for snuggling under. Tea, coffee and sugar provided for that essential cuppa when you first arrive, we just ask you to top it up for the next guests. Kitchen with gas cooker, fridge/freezer, kettle, toaster, cutlery, all crockery, glasses and kitchen equipment. Plenty of books for all ages on the shelves in the sitting room, feel free to make use of them and if you have any you don’t want to take home, you are welcome to donate your unwanted tomes! There is a small selection of board games, playing cards and group games. A small selection of children’s toys, puzzles and games are in the ottoman, and the two side units the lamps sit on. Seating for 6 at outside table with teak dining set incl. parasol. Notes on accommodation: Sorry, no pets allowed. We are so delighted you enjoyed staying at our apartment and should you ever need accommodation again in the area in the future, please do not hesitate to get in touch. Thank you for your lovely review. As members of a family dotted around England, coming together and staying here (main reason to watch my son performing in Titus Andronicus on Brownsea Island) - we were all so impressed with this apartment! It is indeed stylish, and large and exceptionally well laid out. Everything is quality and included for comfort. We cannot fault it in any way. Excellent! We definitely hope to be able to stay again next year - and hopefully for longer now that we have found this wonderful apartment. Dear Kaz, thank you for your kind words. It is always lovely to know we have happy guests and that there is nothing more we can provide to improve the service and facilities at our apartment. You and your family are most welcome back anytime. Very nice apartment with a real holiday vibe in a quiet area, close to beach. We liked our stay in this apartment so close to the beach. Very nice, comfortable cool and roomy apartment (4 apartments all together in the house). Very good amenities inside the apartment. The beds could -for our taste- have been a little softer, but it didn't effect our sleep. We had a great time at the beach which is really a few minutes walk down a marvelous shaded footpath. Great views to Old Harry Rocks and the Isle of Wight. Beautiful surrounding area. The contact with the owner went very smoothly. Any issues were solved immediately. Very good experience. A place to come back to. Great Flat. We traveled from the USA and Jess made the process super easy. Great flat, great location, can walk to beach and restaurants easily. We had a small issue and the owners resolved that quickly by personally coming to the property to get things in order for us. Highly recommend this property. We had a lovely 3 nights stay at this beautiful apartment. It was spotlessly clean and had everything that you needed. It was in a convenient spot close to beaches and shops. I would highly recommend this apartment as a good holiday base. We will definitely be going back. Stayed in this apt for the second time this year. Communication with homeowner is excellent. Our stay was just as good as the last if not better as it had an extra tv in the guest bedroom! This apartment is close to all amenities and the promenade. Enjoyed our trip to Beaulieu for Fathers Day. Thank you for another fab long weekend! We are only a few miles from the Studland Bay beaches and the whole Poole Harbour coastal area. The perfect base for cycling, walking, sea swimming, bird-watching, sailing and motor boating, kayaking and windsurfing, kite-surfing and rock-pooling. We welcome 2-14 night rentals according to calendar availability.